The answer is a system which differs in almost every respect from the status quo, and one which would start seamlessly and immediately. People would start to retrieve journal archives and torrent them. Universities would set up basic systems for access. Someone would write a Chrome util that linked your PubMed page to a torrent of the article. Researchers with huge personal archives research stored in Endnote, Zotero, Papers, ReadCube, etc. would find a way to export them. Heathers argues that a strike of large scientific publishers would soon be recognized as an opportunity for re-establishing an entirely different publication system based upon open access principles. The key practices of scientific knowledge creation – authoring and reviewing research articles – could be accomplished on open platforms such as ArXiv.org or the Open Library of Humanities, which are funded by libraries, universities and research foundations. With Open Journal Systems we already have an established open source software for scientific journals, hosted by universities such as the FU Berlin or the University of Vienna – to pick just two examples from the German-speaking area. To sum it up, if large scientific publishers would suddenly go on strike, the existence and functioning of the scientific community as well as the production and quality assessment of research outputs would not be endangered at all. Actually, the seemingly overwhelming market power of the big scientific publishing houses is built on sand. Neither authors nor reviewers of research articles get paid by publishers. Still, publishers demand exclusive rights from authors and ever increasing subscription fees from publicly-funded libraries. 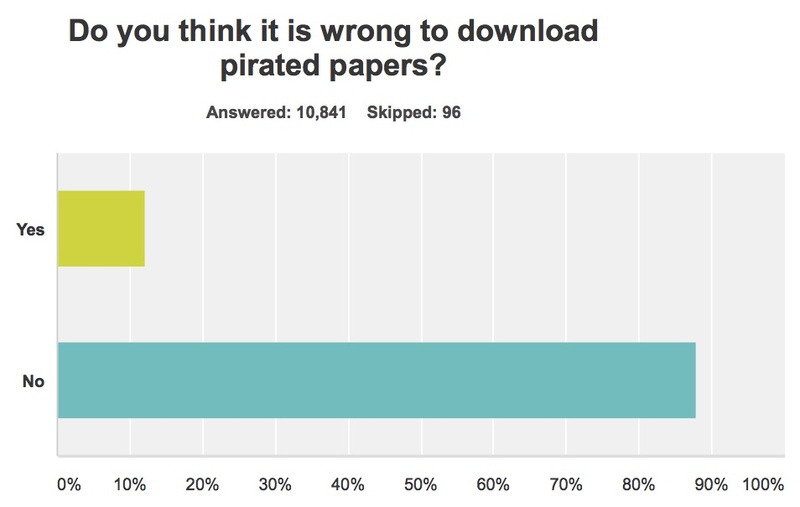 In spite of huge productivity gains through cheap digital distribution over the past twenty years, research institutions were forced to pay more just to increase publisher’s already ridiculously high profit margins; no wonder that illegal platforms such as Sci-Hub – a kind of Pirate Bay for research articles – is booming and its users have no guilty conscience whatsoever. The publisher had indeed provided us a first offer for a collective license agreement after month-long and intense negotiations. However, this offer rejects open access principles and all arguments for a fair price level: in spite of the extant profit margin of 40 percent, the publisher demanded gigantic price hikes beyond previously paid licensing fees. Furthermore the publisher categorically refuses transparent business models, which are based on publication services and make publications more openly accessible. The consequence of not reaching an agreement is lack of access to Elsevier publications at over 60 German universities and research institutions, including many of the largest and most renowned players in the field. Since Elsevier had refused any “grace period” or “trials”, access was lost immediately and researchers are forced to rely on interlibrary loans (“Fernleihe”) to get to their articles – or turn to illegal alternatives such as Sci-hub. With one month into the ‘Elsevier Strike Test’ in Germany, the coalition of research institutions still stands together in solidarity. Seemingly, Heathers was not too far off with his guess that publishers depend far more on researchers than the other way round. Of course, it is way to early to declare victory. But that research institutions start to actually challenge Elsevier is a great development. And you should not be surprised if particularly German researchers use the hashtag #icanhazpdf on Twitter more frequently this year.